I found the Shah Law group through a referral. Ironically it was from someone who had been on the other side in a divorce. My case was handled by Kristen Anders Bojarski. Every divorce is different and mine required decisive action from the start. Kristen immediately jumped into action with measures to protect my assets. Divorce is never pleasant but having the confidence that you are in steady hands is a great comfort. Kristen was very measured in her assessment of my case and did not promise anything that could not be delivered. My case was handled in a settlement which was fair to both parties. You can’t ask for a better outcome than that. I highly recommend the Shah Law Group Team to anyone looking for a competent, no nonsense law firm who will get the job done. I can’t thank Kristen and everyone in the office enough. I was really messed up when my ex filed. They walked me step by step through what was going on and what to expect. They were right about everything. They take incredible care of you. I can’t recommend them highly enough. The Shah Law Group team was incredible. You get so much more than just a lawyer you get the team. Kristen was my attorney and she provided great legal advice, support, guidance, and direction. This was a bit of a messy divorce, but she and the team helped me keep my head on straight and focus on the end goal. I would highly recommend them as they came highly recommended to me. I cannot say thank you enough. Did what she promised and began to work on my case immediately. No “pie in the sky” promises. I would recommend and refer potential clients for family law to Shah Law Firm .The staff is excellent they’re always prompt and on top of everything . Kristen A. Bojarski is a top notched family law attorney that really helped me resolve my family legal matters with favorable results . I would highly recommend Kristen as an attorney! She is very knowledgeable, experienced, and professional. She fought hard in court for me during my divorce trial. Shah Law Group’s staff is also very helpful and organized. They are there to support you on daily basis! Thank you! Shah Law Group was invaluable in helping me through a difficult time. After making the decision to end my marriage and worrying about my children’s well-being, I didn’t know which end was up. I was dealing with a volatile spouse, highly contested custody, financial stress, and the overwhelming emotions involved in divorce. Barbara, Kristen, Carole, and Beth were there for me throughout the process and have been there for me since. Barbara and Kristen worked on my case in a seamless, parallel manner, which provided an environment in which my needs were always addressed. Barbara’s knowledge of the law and experience allowed her to navigate the legal system skillfully and powerfully. I was in constant communication with Carole and Beth and they went above and beyond to provide support and dedication during many difficult times. Whether it was Barbara, Kristen, Carole, or Beth, they consistently listened to my concerns and validated me. I was always informed about everything that was happening and was expertly advised on when to negotiate and when to stay firm. I trust the work and ethics of all the staff at Shah Law Group and was confident when making important decisions for myself and my children. Shah Law Group looked after my future interests, not only as a divorced person, but also as a mother. They continue to look out for my personal and familial interests and have represented me righteously and honestly during one of the hardest times of my life. I recommend Shah Law Group, without reservation, and have done so to family and friends. Attorney Barbara Shah represented me in a difficult divorce case. She defended my position in a fair, clear and concise manner. She is an honest and trustworthy professional who took the time to explain all my options and provided me with sound advice and guidance. I was very pleased with the outcome of my divorce settlement. Barbara’s depth of knowledge of the law is unsurpassed. Her broad network of valuable professional experts were available if my case required their testimony. Barbara negotiated with the opposing counsel to successfully settle my case without trial. The entire office staff worked as a team and did an excellent job keeping me informed about ongoing developments in my case. I will continue to seek Barbara’s legal advice and counsel if the need arises and I will gladly recommend Shah Law Group to others in need of legal representation. Shah Law Group is a firm worth your consideration for personal legal work for the following reasons: The legal experience that Barbara Shah possesses in ALL areas of Family law is vast and she uses that with effective legal game plans for your case. The network of Professional advisors in finance, real estate, estate planning, etc. is essential for a comprehensive legal representation. 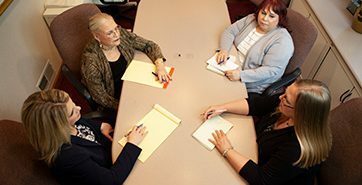 The Shah Law group team of Kristen, Carole and Beth provides a bench of talent that is used effectively in a timely manner when needed through the events of your case. Barbara allows you to choose your own path of action throughout the case by giving you alternative courses of action. No question is irrelevant for Barbara and team. My previous attorney for the first year of my divorce proceedings had not met my expectations. Therefore, I decided to contact Shah Law Office in search of a professional who would fight in my behalf. Upon calling the office, I spoke to the Office Manager, Carole, who was extremely helpful and sympathetic to my needs, and instantly I felt I made the right decision. Communication with in the entire office and between myself was excellent. Attorney Shah always conducts herself with dignity, diligence and dedication. If for some reason, Attorney Shah was unavailable, Attorney Kristen Anders Bojarski was there with the same ethics and caring I had come to know. Divorce is never easy and gets very messy at times, but if you use the services of Shah Law Offices, you will definitely be pleased and your mind at ease that every aspect in your behalf was handled with the utmost attention. After unsuccessfully trying to resolve a legal issue on my own for almost two years, I was referred to Shah Law Group. Barbara resolved my case without having to go to court and it was finalized within 2 months. I was very impressed by how well respected Barbara is within the legal community and the reputation she has for being a vicious fighter for her clients. My favorite was when I mentioned her name in my office and one of the gentlemen said, in a low drawn out tone, “Oh yes, I know Barbara very well and she is VERY good. “I asked him if he had hired her for some issue and he replied, “No, but my ex-wife did!” Good to have you on MY side!! Before I met Barbara Shah in March of 2012 I had been through 2 years, 2 attorneys and $30,000 of legal fees which resulted in nothing. Within one month of obtaining Barbara and her staff she had a petition filed and a court date set. My divorce was very complicated as it involved both personal and business aspects. Within a year everything is pretty much finalized and I am finally ready to move on with my life. What a difference it makes to work with a knowledgeable, experienced, dedicated and caring attorney. Thank you Barbara, Kristen, and Carole for making me feel like one of your best friends and your most valuable client and getting me through one of the most difficult times of my life. In the process of enduring a contentious, combative divorce, it became apparent I needed a lawyer who was a forceful; and willing to do battle with a lawyer who had “represented executives from some of Pittsburgh’s largest companies.” The firm is known “for taking on adversaries considered by many to be unchallengeable.” With the help of her office staff, Barbara won an extremely favorable settlement. They continuously fought through the skewed family court system in order to attain what I was entitled to. If you are in need of a law firm that will not back down, nor be intimidated, and fight your legal battle as if it were their own, then Shah Law Group it the one you need to retain. To this day, the ex complains about the “unfairness” of the settlement. Need I say more?